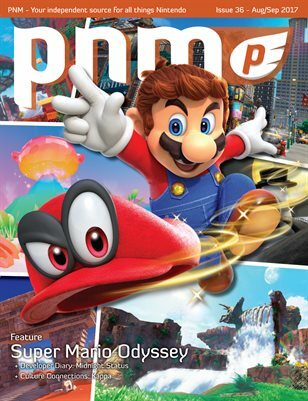 Issue 36 features everything we know about Super Mario Odyssey! We go in-depth on the many kingdoms, hats, outfits, and more that are featured in the game and also discuss some of the series’ sandbox roots. Our YouTube Gamer feature is also back with Shawn Long and his channel, RGT 85. We have the first in a series of new Developer Diaries from Midnight Status as they discuss their upcoming title, Swap Fire 2. Katelyn also worked up a feature entitled ‘Culture Connections’ where she discusses an interesting creature from Japanese lore that has wound up in many Nintendo franchises. Be sure to also check out our Top 3 Super Mario Maker course submissions this issue. As always, take a look at this month’s concept art (the Ever Oasis artwork is simply awesome this issue!) and all the latest reviews! Happy Gaming!